Namo Narayan is a mantra, which yogis, swamis and others use, when they greet disciples of another guru. A longer version is OM Namo Narayanaya. The mantra implies: I greet god in you. This custom expresses a tolerance which is unique to India – and very important for the preservation of a very special spiritual tradition. For the individual, this greeting means that superficiality is eliminated. It ensures that one does not, from fear of missing out on something, run from one teacher and method to the next, without ever confronting the whole of oneself. Here, in fact, it is permitted and acceptable to surrender to one teaching and one teacher, when you are serious about self-realisation. The use of Namo Narayan is also important for society. You avoid sectarian and know-all “supporter-clubs” around the gurus. Sects very seldom arise in India with that negative interpretation known in the West. The concept, Namo Narayan, is fundamental in that part of Indian culture where yoga is kept alive. The mantra expresses that no matter where you come from, then I respect the path you have chosen. I greet you! I bid you welcome, as I would god. I can exchange experiences with you on equal terms. 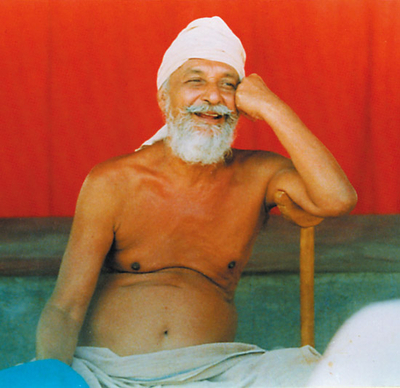 When a well-known guru – whose teaching has substance also for the West, and who has been visited by many different people over the years, some just to shop around, others to be touched and be trained and still others to receive help to live a life in concentration and meditation or to become able to fulfil the task which is that person’s calling – when such a guru suddenly one day greets his disciples with Namo Narayan, what has happened? Let me relate this in a personal way: In the summer of 1988, I was in the USA to work on, among other things, an English edition of my book Yoga, Tantra and Meditation in Daily Life. For a time, I lived on Long Island and, late one afternoon, I went for a swim with a couple of friends in the Atlantic. The waves were bigger than I had expected, and I was knocked over several times. At first, I was just annoyed that my bathing trunks slipped down and my hair was washed forward, covering my face so that I was unable to find my bearings. Then I realised that this was serious. After being knocked beneath the waves more times than I care to remember, I managed to fight my way ashore. Never as an adult have I been that short of breath. At the same time, I felt incredibly good, having fought my way out of the ocean. The experience gave me perspective on my life. I saw the twenty years I had taught yoga, and felt strongly inspired, in one way or another, to go on for another twenty years. Later, at home in Sweden, I had a vision – no, a total experience – in my meditation. I am in a landscape that looks like the foothills of the Himalayas near Rishikesh. I have a feeling of just having left everything – students, administration, routines. I feel endlessly relieved. Now I am free and can go wherever I want and completely devote myself to my Sadhana. Afterwards, I wondered why this wonderful experience of freedom appeared just now, when I was so inspired to go on teaching!? In November 1993, I had been invited to speak at a congress in Monghyr and therefore visited Swamiji, who had then settled in Rikhiya near Deogarh in Bihar. When I told him of my vision of being in the foothills of Himalaya near Risikesh, he just said, “Yes, I thought you should know”. 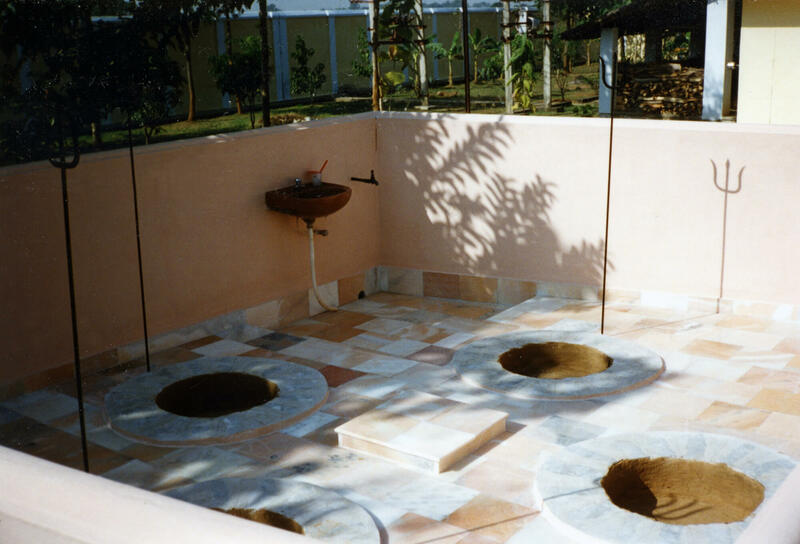 After some years of travelling around visiting spiritual power centres in India, Swamiji had, at his own wish, lived in relative isolation in his new ashram, Alakh Bara. During five years, he devoted himself to a unique meditation, between five fires. Every day, from 15 January until 15 July, from sunrise to sunset with four strong fires just next to him, the fifth being the sun. The first year, he was sitting in just the sun for half a year. The second year he sat under the hot Indian sun next to one fire. The third year he sat in the sun next to two fires. 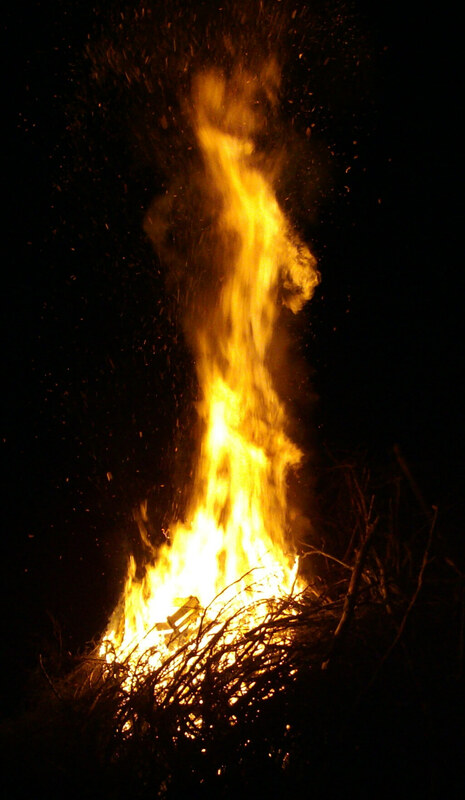 The fourth year he sat in the sun close to three fires, and the fourth year, he sat surrounded by four fires from sunup to sundown, which with the sun above makes five fires, Panch Agni. This fire meditation has a profound effect on the yogi who undergoes this kind of cleansing – the psychic climate around Swamiji was even more powerful and elevated. I felt it especially in my meditations that last and fifth year, when I stayed with him after his fire meditation was over. It is said that since Shankaracharya, no one has practised this meditation. It requires years of an intense and deep Sadhana to be able to carry through and benefit from such a practice.